2012 Brammo Enertia Plus. Picture credits - Brammo. Submit more pictures. Charging is simplified on the Plus. While the Plus displays an almost identical profile to the original Enertia new colors combined with the latest Brammo graphics make the Plus instantly recognizable. Price as new (MSRP): US$ 8995. Prices depend on country, taxes, accessories, etc. Comments: Brammo Power� batteries. Capacity: 6.0 kWh. Voltage: 88.8 V (nominal). Recharge time approximately 8 hours. Battery Life: 500 recharges.850 Watt on-board battery charger, which can charge using any standard 110-120 Volt / 15A electrical outlet (standard US household) or equivalent European household outlet. Ask questions Join the 12 Brammo Enertia Plus discussion group or the general Brammo discussion group. 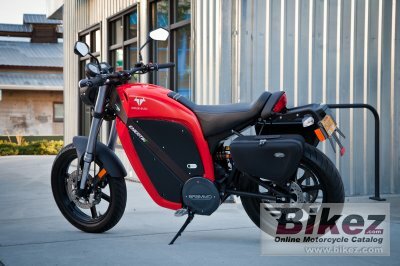 Click here to sell a used 2012 Brammo Enertia Plus or advertise any other MC for sale. You can list all available Brammo Enertia Plus bikes and also sign up for e-mail notification when such motorcycles are advertised in the future. Ads with or without pictures are easy to create. Our classifieds are completely free with sections for every country in the world. You can also check out our list of related motorbikes. Compare technical data. Look at photos. View your fellow riders' rating of the bike's reliability, design, engine performance, accident risk, repair cost, etc.